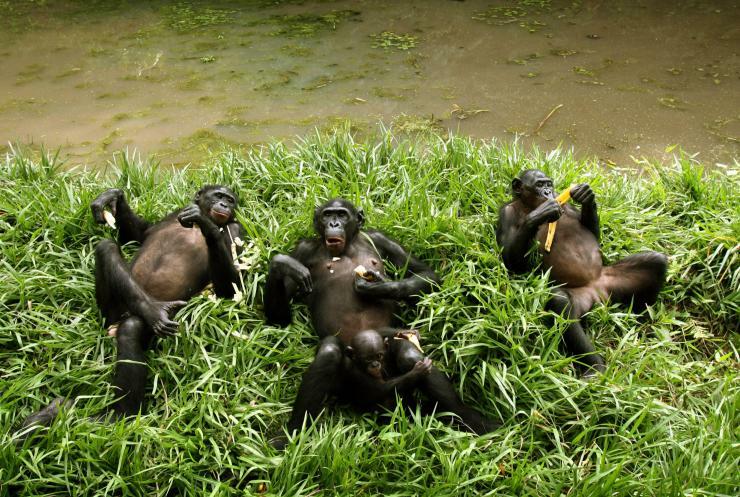 Bonobos chilling to the beat — as well as being pansexual, bonobos like music. How cool is that? I’ve spent a lot of time looking at how societies might have been structured before the development of agriculture. Clearly, we can’t directly study the human groups that existed outside Africa between 50,000 and 5,000 years ago, because they no longer exist. So I also looked at relatives of humans, particularly our closest, bonobos, Pan paniscus. Our ancestors left very little evidence. Although they did use stone and bone, a great deal of their artefacts were made of wood or leather and were perishable. The few that we do have are somewhat mysterious. We reviewed the mythology that was recorded soon after the invention of writing, in Sumer in the 5th Millennium BCE. We then compared this to modern mythologies which form part of traditional cultures. We also looked at similar species, and that’s where bonobos came in.